Invited by John Dugger and David Medalla to participate in the International Festival for Democracy in Chile at the Royal College of Art in London, Lijn originally staged Power Game in the autumn of 1974, in collaboration with her friend, the art critic, Alistair McIntosh. Power Game, was restaged by Lijn on the 28th of July 2009 at the ICA, as a socio-political live performance set in an imaginary casino. More recently, Power Game has been performed at BALTIC (2010), The Arches, Glasgow (2011) and at the Zabludowicz Collection (2012) and Southbank Centre (2016) London. In 1974, Lijn used the Poem Game cards to write Six Throws of the Oracular Keys. A book of poems and drawings, it was published in 1981 in the xeroxed edition Unifinitude by Edition de La Nepe, Paris. Poem Game was played at the Poetry Marathon, Serpentine Gallery (2009), at the Poetry Library, Southbank Centre (2013) and Art14, London. The aim of the game is to write a poem. 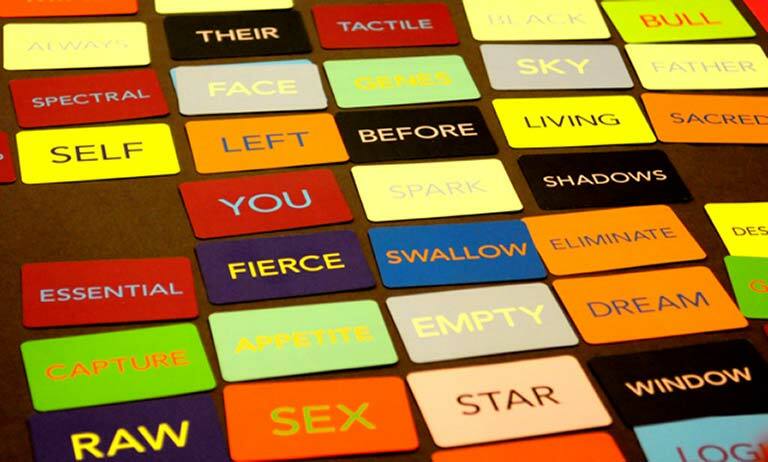 On receiving their cards, each player may automatically put together his/her words into a sentence. However, when it comes to playing, each player in turn can only place one word down at a time. This means that no one player manages to write a complete phrase. Each player must continually adapt their prepared or imagined word sequences to the changes that occur during each round. The intention of Poem Game is to free the players from preconceived ideas of what a poem might be. To this effect, the players use the word cards to collaborate at writing a poem. The game may be played by 2 to 10 players but a small group of up to 5 is best.